Process Serving Technology: Did Dayton really put a PotatoHead in my program? I hear you out there wondering why there is a Mr. PotatoHead on your top menu. Call your friends and tell them Dayton put a ! @#$%ing PotatoHead in your program! You could put any ears and nose or lips on it and make it look unique. That's what this feature does. Want a completely different command center? Different options, branded to your agency? Take things you don't need off of it, put new things on there just for you that the other guy can't see? We can do this. The big guys like everyone to think their software is proprietary. You'd be surprised who runs LD out there. We'd love to tell you, but we are under NDA with some of them and that's fine with us. We want this program to be yours. Something special that you helped make YOUR way that works and looks exactly as you need it to. For years, we have customized the client and server experiences for clients of ours so that their clients and process servers use something unique and branded. Now, finally, the entire INSIDE of the program is going to be this way also. We don't gain anything by putting LDMax all over everything. We'd like to take it off everything and have it look completely unique for each one of our customers. 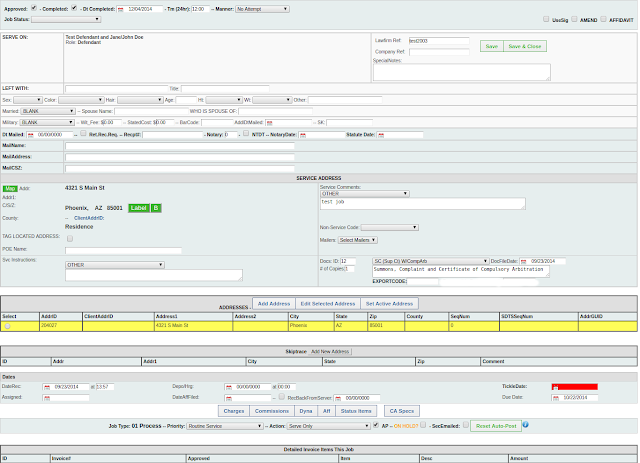 We have custom command center and fully customizable job screens now. Gradually, you will see the entire program made this way and configurable from this screen. It's not just changing the skin... Stylesheets can change the whole way the program flows and what options/reports are only available to your company, not your competitors. Finally, we can make major changes to this program for agencies without everyone getting the feature in their software. That's huge because many agencies want their advanced features to themselves. Our competitors can put extra fields on your job screens and have rudimentary and limited options for this. Nobody can truly integrate into your work flow and your way of doing things like this. Boy, I REALLY wish I could tell you the shops that have branded LD to look like their own stuff - I'm really proud of it and we've done amazing things with it because other designers can design these breathtaking pages and then we just hook the data into it and make it real.